Save your hard-earned cash for fun things instead of on dried fruit thanks to this recipe. Dried fruit is a delicious snack. That's a fact, plain and simple. It makes a great addition to a midday snack of brain-powering nuts and seeds, or adds a natural sweetness to your morning oatmeal. It's the healthy eater's version of candy, in a way — nature's candy, it's been called. So, if you're hooked on a daily dose of dried fruit — first of all, don't get too carried away, it still has a high sugar count — you're probably acutely aware of the tab you can rack up in the bulk section of your supermarket. Especially if you're hooked on popular items like dried cherries, which clock in at $10.99 PER POUND. The good news is, you don't have to subject yourself to those prices any more because My Recipes has bestowed upon us a recipe for dried fruit that requires your preferred fruit, an oven and a little bit of time spent at home. 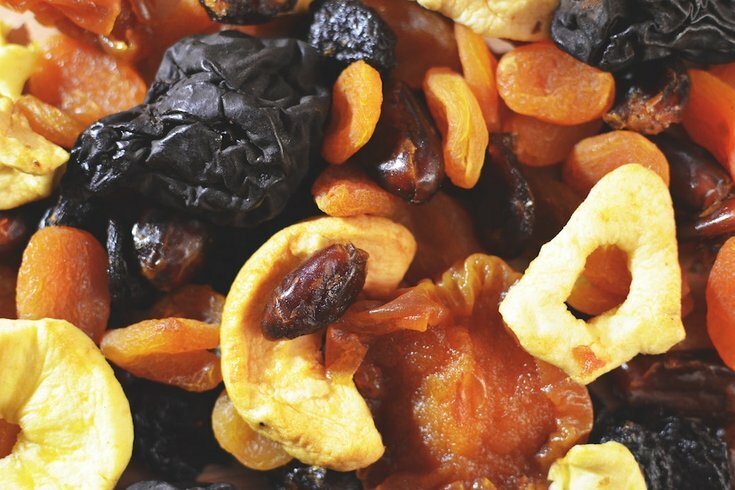 No dehydrator or any other special equipment needed to create a perfectly chewy and sweet batch of dried fruit. "Peel it if it has a tougher skin (apple, plum, banana, apricot, mango, etc.). If you're using a larger fruit, slice it into ⅛-inch slices, discarding pits, stems, seeds, and cores. Blueberries, cranberries, grapes, and other small fruit can be left whole." Place the fruit on a parchment paper-lined baking sheet, leaving some "room for the holy ghost" between each piece of fruit, and bake them at 200 degrees Fahrenheit. And here's the crucial, game-changing tip — you'll want to leave the oven door slightly open! It's a time-consuming process that can take between three and six hours, during which you'll stir the fruit every 30 minutes. When the fruit has dried to your liking — whether that be soft or crunchy — you can close the oven door. Here's to filling your pantry on the cheap!